Batteries have been beating expectations in recent years as costs continue to fall.... Berkeley professor Daniel Kammen [has] devised a new model, recently published in Nature Energy ... predicting future cost declines at a pace faster than previous analyses. Scholars have modeled clean energy cost declines based on single factors, like annual production or cumulative production. These one-factor models approximate reductions from learning by doing: the more an industry deploys its product, the better it gets at it. These models have a high explanatory value, but they didn’t see recent battery cost drops coming. They overestimate lithium-ion costs in the 2010-2015 period, the most recent years in the data set Kammen and his colleagues examined. Their new model explains cost as the function of two variables, production volume and cumulative patents issued under the international Patent Cooperation Treaty. When the researchers plugged in the latest battery production forecasts, with the assumption that patent activity continues at the average rate from the last five years in the dataset, they found ... lower cost reductions than existing forecasts in the literature. At the battery pack level, lithium-ion needs to hit the $125 to $165 per kilowatt-hour range to compete with internal combustion engines (based on 2015 gas prices). The two-factor model predicts EV cost-competitiveness will arrive between 2017 and 2020, ... earlier than the previous[ predictions]. The model also covers solar with batteries. If the solar industry U.S. hits the Department of Energy SunShot goal of deploying PV for $1 per watt (which it has for large projects), residential solar-plus-storage will be widely competitive by 2020. The combination would offer a levelized cost of energy of $0.11 per kilowatt-hour. That would transform residential storage from a niche item for powering wealthy homes during blackouts into a cost-effective investment for anyone who pays a lot for electricity. In one test, the authors scaled down the rate of patent development by one-third. To still beat the energy storage cell cost of $100 per kilowatt-hour by 2020 in this scenario, the industry would need to deploy an additional 307 gigawatt-hours globally. ... Tesla’s Gigafactory aims to produce 35 gigawatt-hours, and it’s not yet completed. Deployment alone is not a practical way to achieve cost declines if scientific innovation drops off. “At the most extreme case of no new innovation, the opportunity cost of meeting cost reduction targets through deployment alone would be extremely high, in exceedance of $140 billion through 2020,” the authors write. ... The Trump administration has proposed sweeping budget cuts across the Department of Energy, which has traditionally spurred energy innovation through research funding. Reports surfaced this week of impending layoffs on the order of 525 jobs at the national labs run by the DOE. Labs in that network performed groundbreaking early stage research that led to the commercialization of lithium-ion technology, and continue to break ground on the sort of next generation chemistries that could spur the “learning by innovation” described in Kammen’s model. “Right when batteries are doing this great stuff, we’re seeing a trail-off in investment,” Kammen said. “We need the Department of Energy to step up, we need the private sector.”. The DOE retains stronger support in Congress, which ultimately controls the budget. Lithium-ion costs are following the path of solar, only faster. “For the same amount of money invested and patents generated, batteries are equal to or ahead of where solar was,” Kammen said. To keep up that pace, he added, it will be important to maintain a robust research ecosystem with many different labs, companies and universities competing for funds and patents. When money gets concentrated in a few monopolies, they tend to under-innovate. It also helps that storage has an array of viable technologies, although lithium-ion has dominated the market thus far. This diversity bodes well for continued innovation. The clean energy transition requires a co-evolution of innovation, investment, and deployment strategies for emerging energy storage technologies. 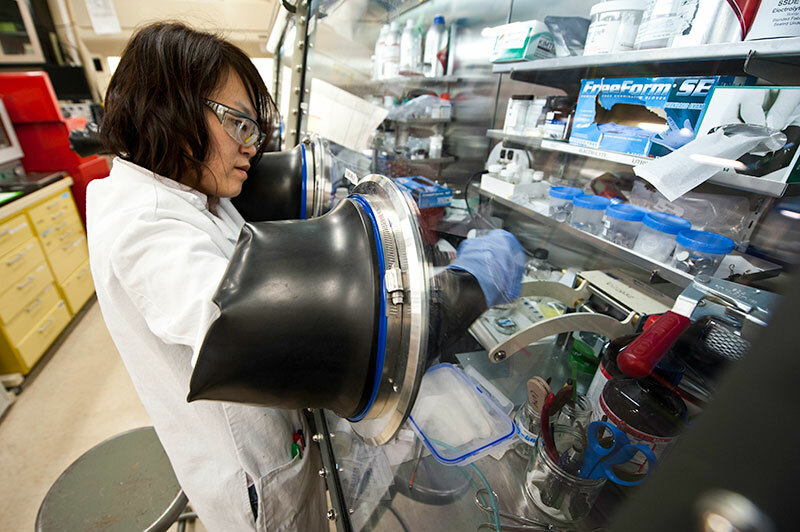 A deeply decarbonized energy system research platform needs materials science advances in battery technology to overcome the intermittency challenges of wind and solar electricity. Simultaneously, policies designed to build market growth and innovation in battery storage may complement cost reductions across a suite of clean energy technologies. Further integration of R&D and deployment of new storage technologies paves a clear route toward cost-effective low-carbon electricity. Here we analyse deployment and innovation using a two-factor model that integrates the value of investment in materials innovation and technology deployment over time from an empirical dataset covering battery storage technology. Complementary advances in battery storage are of utmost importance to decarbonization alongside improvements in renewable electricity sources. We find and chart a viable path to dispatchable US$1 W−1 solar with US$100 kWh−1 battery storage that enables combinations of solar, wind, and storage to compete directly with fossil-based electricity options.